Most types of ant invasions in your home can be treated with a sugar based boric acid bait. But sometimes they don’t work. One time I laid out an array of sweet sugar traps for these unwelcome guests only to see them completely ignored. When your best boric acid bait recipe for ants doesn’t work, it’s time to go back to the drawing board. In my case, I had protein ants. These guys don’t have a sweet tooth and are more interested in food which is slightly more substantial. The recipe below is super quick and easy to make. There’s also an option to add some honey as some ants do like their proteins mixed with something sweet. I agree they’re fussy, but the more you tailor your baits to their delicate taste buds the quicker they’ll be gone. 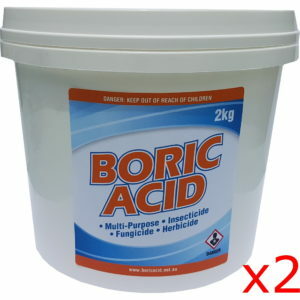 Caution: While boric acid is a least toxic pest control method but still needs to be managed with care. 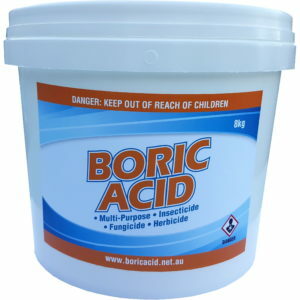 Place homemade boric acid ant baits up off ground level so they cannot be reached by children, pets or wild animals. Home-made baits with Boric Acid are by far one of the most effective, cheapest and least toxic ways of treating ant infestations. The ants will consume some of the bait and take it back to the nest where the rest of the colony, including the queen, will consume it. This poisons the whole colony wiping them out. Ants can be split into two categories based on their diet: sugar or protein. To figure out which ant you have check out our guide to determining whether you have protein or sugar ants. If you want to quickly check if you have protein ants, just leave a teaspoon of peanut butter near where you normally find the ants. If they start to consume it, you have protein ants. Some protein ants also like sugar so you can try some honey mixed into the peanut butter just to be sure. This recipe can take from 4-14 days to be effective. Protein ants do tend to be bigger ants and take a bit more time to eradicate. Over the duration of the treatment you should see a sharp decline in the number of ants with a final trickle of the stragglers towards the end. At the end of the 2 weeks you should be ant free! 1. First determine that you do have protein ants. This bait will not work for sugar ants. 2. Add the peanut butter to the mixing bowl. 3. If you have ants which like sugar and protein, add the honey to the mixing bowl. 4. 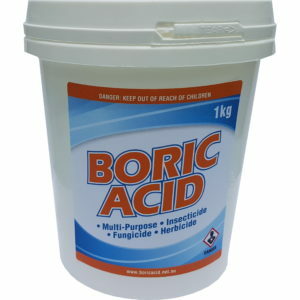 Add the Boric Acid. 5. 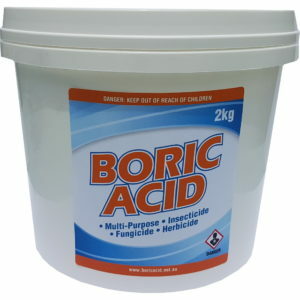 Stir it all together until the Boric Acid is well mixed in. This is crucial because the ants won’t find the bait appetising if it detects large lumps of Boric Acid and will avoid the bait altogether. 6. Place small mounds of bait on each of your small plates. 7. Position your plates near where you normally find the ants. They should find the bait within a few hours. If not, try other locations. 8. Once the ants appear and find the bait it can be tempting to spray them. But don’t! The idea is to allow them to take the bait back to the nest. Let them do all the hard work. 9. You’ll need to replace the baits every 2-3 days if you’re still seeing ants. The ants won’t be interested in the bait once it dries up. You should try to use all the bait mixture because it has a short shelf life and is very sticky making it difficult to store. If you do have excess, dispose of it in the garbage. How do you get rid of ants?If you have your own special process, we’d love to hear about it in the comments section below. When this happens you’ll need to test a wide variety of baits without adding boric acid to see what they like. Whatever’s attracting them to your home would be a good bait to start with. You can lay out many different baits at once. 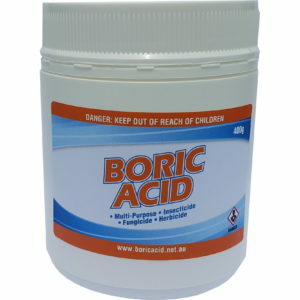 Then make up a paste with the bait they like and add boric acid. 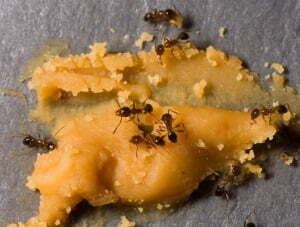 I just tried a mix of Boric Acid and mashed potato and little black ants are munching it up, wait for the result now! I have been trying to find a recipe similar to this that got rid of all my ants previously from the tiny to the mid size to the carpenter ants. This is pretty much the same recipe other than they said to add I think a Tbsp. Of water to keep the baits moist. Also I used masking tape and just painted a bit on there and stuck them on the wall and floor and when they were gone I just peeled the tape up. Worked great I just couldn’t remember the ratio of honey and peanut butter. 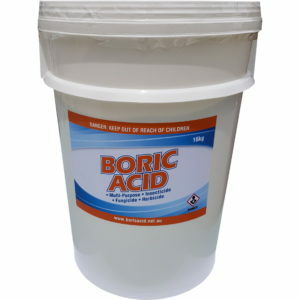 I think the boric acid was only 1 tsp or less. I will have to try this and see of it works as good. I have the large, fire ants, Texas, mid summer. Mixed one to one of a commercial combo of peanut butter and honey. Skippy makes this. From the Walmart laundry section. Made a paste, rolled into a pecan sized ball, placed in a cottage cheese container with holes cut at lower sides about 1/4 inch from bottom. After a day or so, no more ants. You may have more than one colony. Place new bait where you see ants. Wait a few days…ghost town. FYI… cinnamon is a GREAT repellent. But do not use near bait or they won’t come.